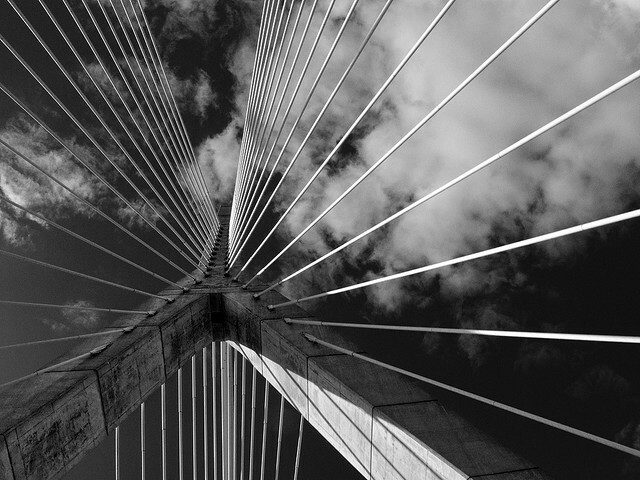 The Leonard P. Zakim Bunker Hill Memorial Bridge (Boston, MA), by garreyf. It’s the week after Labor Day and thus that time of year again … to look back and look forward and wonder when that third year (that seemed so speedy-fast and incredibly filled with eventfulness at the same time) slid by and to wonder what the year ahead is going to bring. Hard to believe this is the third anniversary, already, of my move to Boston. (See my post from the end of year one and from year two here). With the hectic nature of the last two weeks (punctuated by several severe migraine-grade headaches), I can’t say that I’ve had a lot of time to reflect meaningfully on the question of whether I feel more authentically “Bostonian” now than I did at this point last year, when I was still very much on the fence. But here I still am, and here Hanna and I are likely to stay for at least the medium term (job opportunities willing!). I admit, in my heart of hearts, to longing for the Pacific Northwest now and again, since it has always felt like something of my second home — and both of us have close friends and family ties there. But the possibility of such a cross-country move is in the distant world of future possibilities, alongside Hanna’s equally important lifelong desire to live, for at least a time, in England. For now, our life is here. And a jam-packed-full life it is at the minute! Hanna, who graduated with her MA (History) and MS (Library Science) last December, is working as a processing archivist at the Countway Medical Library at Harvard and as an archives assistant at Northeastern (a position I now share with her). She’s working on studying for her GRE, with plans to pursue her PhD in Irish History, and in her spare time can be found blogging both at …fly over me, evil angel… and her recently-created companion tumblr feed, evil angel. I suggest to any of you reading this that you check out both if what you’re looking for are all the most entertaining links on current events in Britain/Ireland, in the world of books, libraries and archives, and genre fiction/film. As she regularly points out, Hanna’s RSS feeds are way more diverse than mine, and I always end up learning the most random and interesting things! I’m in my final semester of work for my Library Science degree, and taking two classes: one on archives management and the other on the curation of digital materials. While both classes promise to be useful for my future work as a librarian, I’m definitely ready to be finished with formal schooling. Being a student makes me claustrophobic, prone to migraines, and depressed; it also tends to sap the pleasure out of the pursuit of learning, which I adore, and on the whole seems to be an unhealthy sort of thing for me to engage in. A bad match, personality-wise, I’ve discovered. Ironically even more so when the learning is intended to be of professional use rather than something I do because I find it intrinsically valuable (as with my history research). Meanwhile, I’m working at my beloved Massachusetts Historical Society (from whence I am writing this) and also at Northeastern, as previously mentioned, where I tag-team a position as archives assistant with Hanna. My latest project is 20.65 cubic feet of records from Northeastern University’s cooperative education program, dating from the mid-1970s to the present. Lots of folders of interdepartmental memos and committee meeting minutes, not to mention all the internal dramas to which any organization is prone. I should also (fingers crossed!) finally be wrapping up, this October, the Marjorie Bouve scrapbook digitization project. We still don’t have a firm idea for how to display the images and information for users, but as soon as we have anything up and running I’ll be sure to link it here. That’s all going to keep me more than busy enough, although I’m definitely looking forward to an October visit from my parents, over the Columbus Day weekend, and to some new blogging projects (i.e. the continuation of reading the (lesbian) classics with Danika the Lesbrarian; my copy of Beth Goobie’s Hello Groin arrived in the post just this morning!). Meanwhile, I’m looking forward to staying in touch with y’all via the usual modes, posting here when I can, and tumblr when I can’t. Best wishes for a lovely early autumn to you all, wherever you may be, and you’ll be hearing from me soon enough.